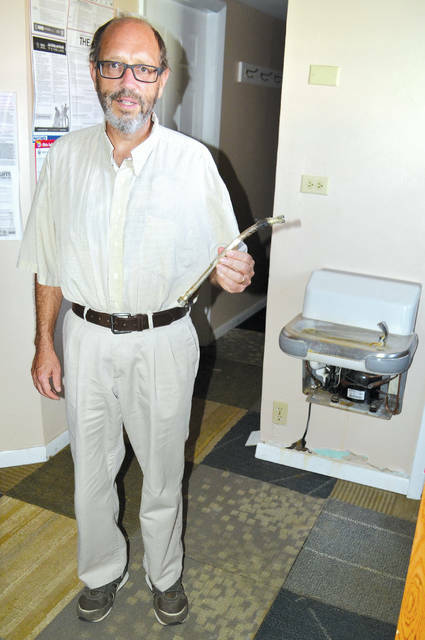 Operation Rebirth Director Sam Ronicker holds the broken hose responsible for submerging his school’s classroom in 3-6 inches of water on Sept. 26. ST PARIS – The Operation Rebirth boys boarding school is recovering from a flood in the classroom and office building caused by a leaky hose inside the classroom’s water fountain. New paint and carpeting will be needed, according to Director Sam Ronicker. The classroom was discovered submerged in 3-6 inches of water on Sept. 26 following a day-long field trip to the Ohio Caverns near West Liberty. Ronicker said he has no idea how the leak occurred, describing the faulty part as “an aircraft-quality steel hose.” He said the insurance company sent a service company to put holes in the walls and dry out the carpet, but the building has been uninhabitable. Volunteers from Christiansburg Church of Christ in Christian Union offered to perform drywall repair. Ronicker said it cost about $5,000 to dry the building and another $5,500 for new carpeting, which he hopes to replace this weekend. Damaged property included two computers, several library books and furniture that included a teacher’s desk and school chairs. Operation Rebirth accepts no public funds; all property had been donated. In the meantime, the nine 11- to 17-year-old boys at the school have been holding their daily classes around the dining room table. Ronicker said the damage had slowed them down because they had to move everything from the classroom. He added he is grateful that the dormitory in a different building had not been affected. Operation Rebirth was started in 1977 and has been located near St. Paris since 1980. Boys staying there are taught five basic courses – Bible, Language Arts, Math, Government and History. They have access to a wood shop, metal shop and agricultural area. In addition to one teacher and two dorm parents, the school works with a chess and logic teacher, an art teacher and a conversational German teacher. “These are boys that don’t do well in mainstream education, and they’re usually having trouble at home, too,” said Ronicker. “We work with respect, responsibility and building good relationships. We have a year-round school, so boys are here for 10 days at a time and then they go home every other weekend to practice those skills. Operation Rebirth is a working farm, and they raise about 80 percent of their own food. They work hard on the farm. They do a lot of community service, too. Anyone wishing to make donations or offer volunteer services to Operation Rebirth may call 937-663-5765.